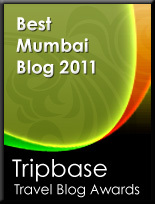 The pleasures of wandering through Bandra are many. 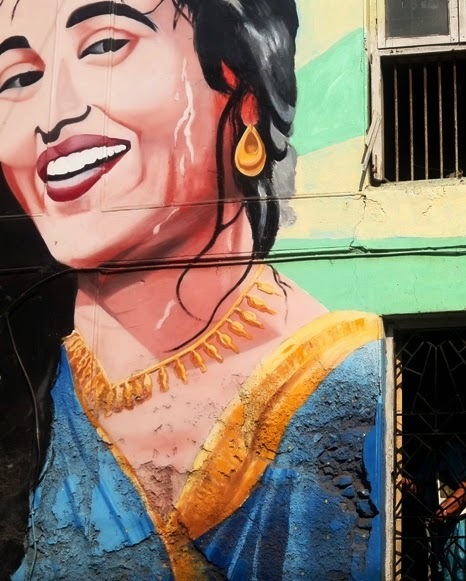 Bollywood Art Project's Madhubala is one of them. It brings all of Madhubala's vivacity to Chapel Road! 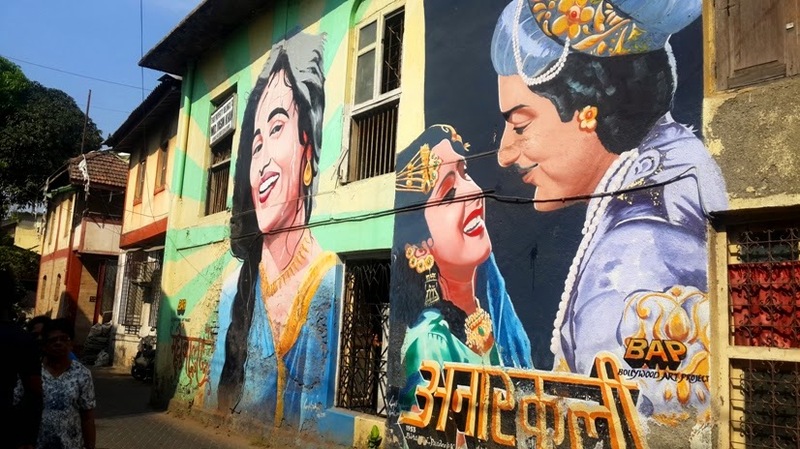 Earlier there was only the Anarkali painting, with Madhubala and Pradeep Kumar. But a year ago, the good folks at BAP added a solo Madhubala. 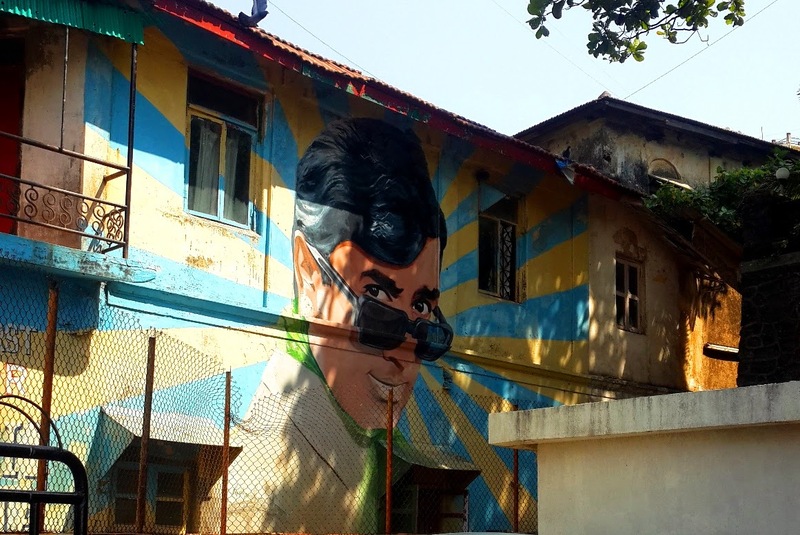 I had posted earlier, their iconic Deewar one with Amitabh Bacchan: it is on the road going downhill towards Bandstand from Mehboob Studio. 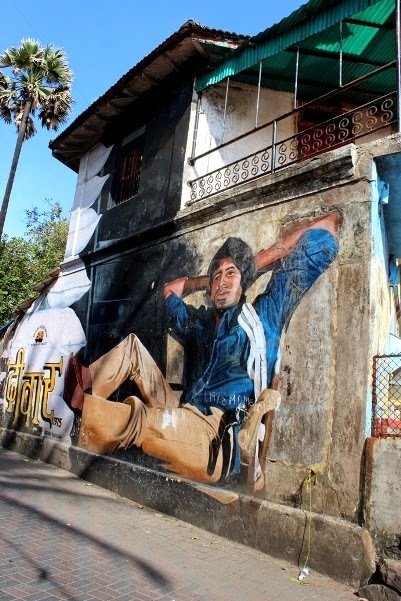 And here is the Rajesh Khanna one - capturing all the charm that made him Bollywood's first ever superstar. 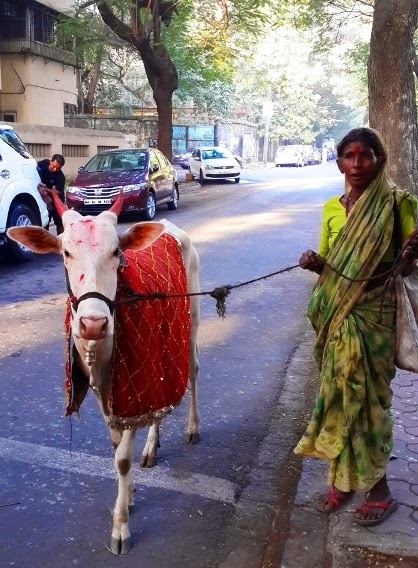 Once Diwali is over, the Nandiwale begin to make their appearance in Mumbai, accompanied by their sacred bulls. 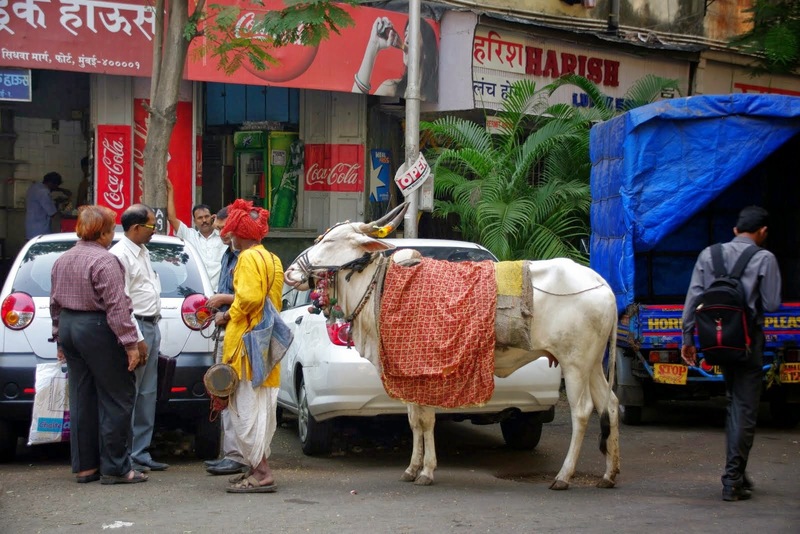 They are one of the many nomadic tribes of Maharashtra. The Nandiwale originally belong to the state of Andhra Pradesh. They migrated to Maharashtra in two waves: the first wave came about 800 years ago; and the second, more recent wave, came 250 years ago. Those who came in the first wave now number around 2500; and they are called the Tirmal Nandiwale. Those who came in the second wave are larger in number, currently around 5500, and they are called the Fulmali Nandiwale. The two sub-sects do not intermarry. They speak Telugu and Marathi; and many can follow Hindi as well. 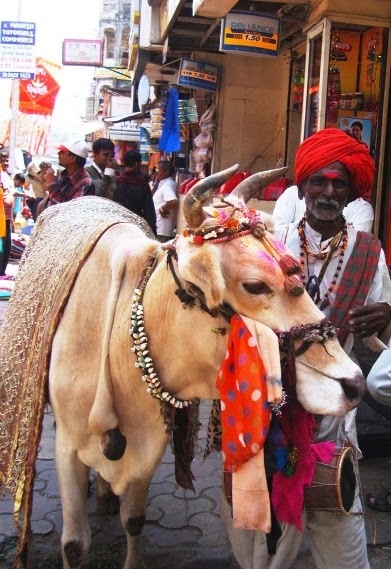 After Diwali each year (around Oct-Nov), the Nandiwale set out with their bulls, going through villages, towns and cities. Sometimes the bulls they bring have an extra leg, or other deformity, like the one in this photo. By Mahashivratri (Feb/March), they return to their village areas with whatever they have earned. In earlier days, they were often paid with foodgrains. These days they mostly receive coins from people. 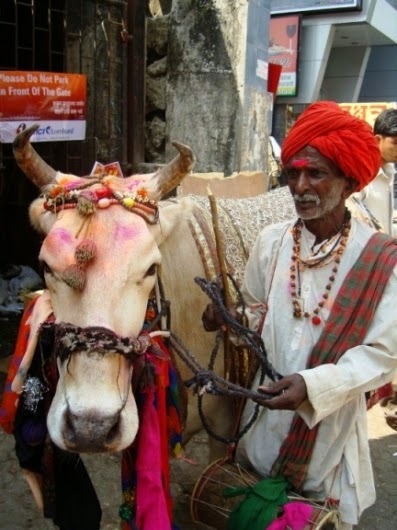 But the charm of the Bholanath (bull) answering questions is no longer appreciated these days. With dwindling incomes, many people from the community have taken to buffalo-rearing and trading as alternative careers. The Nandiwale are one of the Vimukta Jati or Denotified Tribes; who were listed by the British as Criminal Tribes. After Indian independence, they were removed from this list (denotified) in 1952. In spite of this, they continue to be discriminated against. 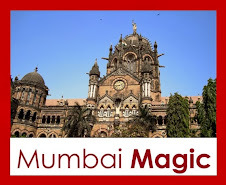 Since they are not classified as Scheduled Caste or Scheduled Tribe in Maharashtra, they do not have access to many of the development schemes run by the government. There is a lot of information about the community in the book "The People of Maharashtra" by Popular Prakashan. I learnt, for example, that the Nandiwale do not cremate their dead, but bury them. I also learnt that they have the system of bride-price, paid to the bride's father, while asking for the daughter's hand in marriage. Marriages are arranged by the parents, and the wedding ceremonies are similar to the Kunbi ceremonies (turmeric paste applying function, holding the cloth between bride and groom, etc). 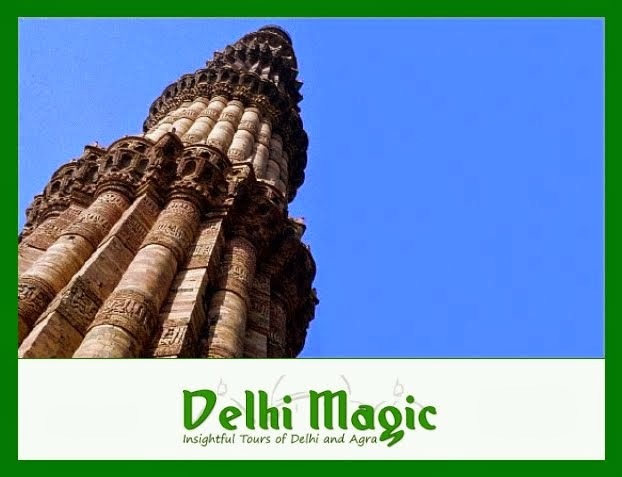 They worship the Goddess Mahamai (Lakshmi); they celebrate Ashad Purnima (June-July). They like going to Tirupati to pray to Balaji. They have their own law and order system, they revere their ancestors, they are fond of listening to the radio, and they are fond of non-vegetarian food :) especially because many of them also have fishing and trapping skills. The more I read about the Nandiwale and their social structure and cultural traits, the more I realised how complicated and beautifully diverse Indian society is. There are so many communities about whom I don't know anything; but each has a unique culture, with rituals, festivals, beliefs, practices. Take a peep at the book I mentioned above, and you will see what I mean. Wah re mera India. As usual, I am humbled and amazed by my country's diversity.